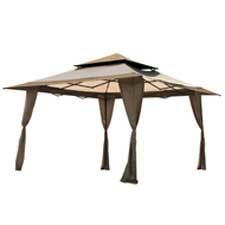 ﻿ E-Z UP Canopies, shade structures and accessories. | Sports Facilities Group, Inc.
SFG is an authorized E-Z UP dealer. Sports Facilities Group offers maintenance and repair service for all types of sports and athletic equipment including E-Z UP canopy and shade structures, bleachers, scoreboards, LED signs, marquee signs, baseball field equipment, basketball backstop structures, volleyball net systems and much more. It is our mission to supply the highest quality equipment available, at competitive pricing, teamed up with the very best technical assistance and service available in the industry. We also specialize in knowing what the latest safety standards are in the industry for all types of sports equipment and bring that knowledge to every facility we help design, service, upgrade, or repair. We carry all E-Z UP products, accessories and repair parts, call us today for a quote. 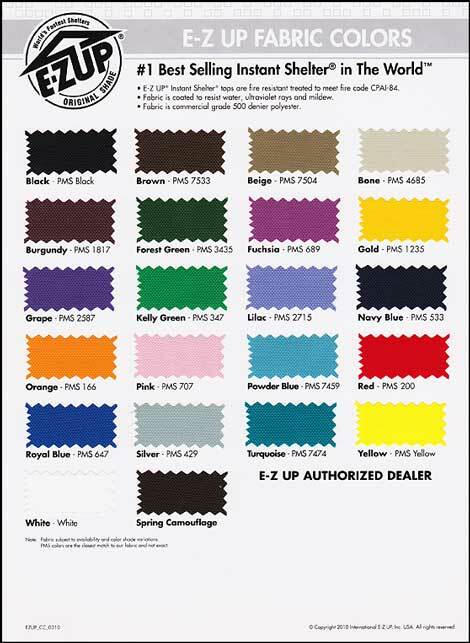 E-Z UP has product lines to fit any budget. The recreational line is an affordable light weight system that is suitable for occasional outdoor activities. 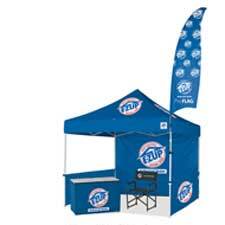 Perfect for quick sun shelter alongside the playing field for parents, kids and boosters, the E-Z UP recreational products can be customized with your choice of art work such as a team logo or school name. The professional line of structures are more heavy duty than the other lines, featuring stronger metal materials and optional aluminum structures with thicker canopy fabrics. The professional line is best suited more for regular daily use, such as for a school team during practice and game day. Because the professional line is also the most customizable product and features a complete system of accessories, they are also better suited for situations where visual impact is desired. The commercial line falls in between the recreational and professional lines and is best suited for routine use in any field. The canopy tops of E-Z UP structures can be customized with a choice of artwork from silkscreen to full color digital images. In addition to the canopies, there are many other accessories such as sidewalls to enclose the under canopy space, side rails and free standing walls to control the flow of traffic, flags to call attention to your presentation area, and table covers to complete the whole design. The E-Z UP product line also includes rugged table systems to make your presenters, officials & visitors comfortable under the protection of the shelter. All of these items can be customized with your artwork. E-Z UP structures range in sizes and shapes, starting with 8 x 8 structures up to 10 x 20 in shapes that include square, rectangular and hexagonal. Call Sports Facilities Group or Shop for E-Z Up shelters online today to discuss your specific needs and we will help you design a system that fits your budget and needs. From a simple light weight structure to a complex array of shelters arranged into a large display area, we can find the right solutions for you. Quick and easy to set up, without the need to assemble many parts. 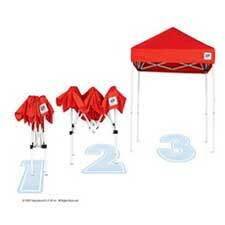 The original quality brand of instant shelters. Customizable with your company/school/team artwork, including full digital images in color. Come in an array of fabric colors. Meets the CalOSHA heat safety requirements for workforce shade. Compact and easy to manage. Sports Facilities Group carries all repair parts and accessories for E-Z UP products. This site is hosted and optimized by Gibson Network Services Inc. Riverside, CA.